BOOK ONLINE NOW for Dance Around the World! 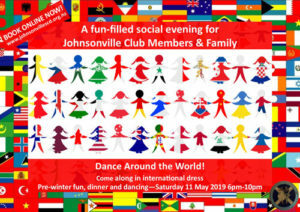 Join in and Dance Around the World at this year’s pre-winter social gathering, as we celebrate Johnsonville Club’s diverse membership and the world-wide community of Scottish Country Dancers. Socialise with pre-dinner nibbles and a cup of mulled wine or fruit punch, then enjoy a hearty buffet meal followed by delectable desserts – all dietary restrictions will be catered for. There is limited space at St John’s Church Hall – Johnsonville Club Members have priority. Bookings are now open for Johnsonville Club Members and their immediate families only. Spaces may be available at a later date for other guests. $25 each for Johnsonville Club Members & Members’ school age children. insert ‘Dinner’ in ‘Particulars’ and ‘Your name’ in ‘Reference’. (b) CASH/CHEQUE: Please complete this online booking form and then give your payment directly to Allison at Club with your details. Email Allison to add other guests to a wait list for possible spaces. Payment of $30 for each wait listed guest is NOT NEEDED at this point. This entry was posted in Events on April 20, 2019 by admin.